Indiana Jones. Treasure hunter, adventurer and part-time archaeologist. (Or maybe it should be the other way around…) The character was the brainchild of George Lucas and the movies surrounding Indiana Jones were the result of director Steven Spielberg’s magic touch. 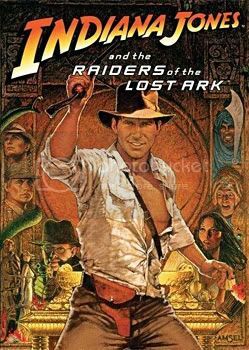 Raiders of the Lost Ark was the first of these movies. It was released in 1979 and became an instant hit, with Indiana Jones as the archaeologist’s equivalent of James Bond but with less hi-tech gadgetry and dashing suits. The combination of a clever script, great cast performances, well-defined aesthetic and delightful music make this a timeless film that’s worth talking about. Raiders may not have a stellar storyline – when distilled to the most basic premise possible, it is “a treasure hunter looking for treasure” – but there is a certain charm and wit to it that makes the story very accessible and enjoyable. There are also some brilliant scenes and sequences which do a lot to move the story along. One example is how the film opens with Indy braving an ancient South American temple in search of a golden idol. He has numerous close calls with danger but always comes out relatively unscathed despite huge spiders, arrows that shoot out of the temple walls, a giant boulder that chases him gaily out of the temple, double-crossing assistants, poison darts and unfriendly natives in alliance with his nemesis, the Frenchman Belloq. The golden idol in that temple has nothing to do with the rest of the film but the little episode serves the purpose of rapidly introducing and establishing not only the main character and his archrival, but also setting the tone (excitement, fun and adventure), style (in the manner of old school movie serials) and pace (quick and action-oriented) of the film. The film does not always move at breakneck speed, but it very wisely pauses occasionally with a calmer scene and uses these little breathers with skill. The scene on the verandah, for instance, introduces Sallah who brings Indy information about the Nazis’ doings in Cairo and this information will determine Indy’s next move. The scene is inserted between two action-packed sequences – the fight at Marion’s tavern and the chaos in the Cairo marketplace. Such interludes allow the viewer to sit back and “rest” a moment but at the same time advances the narrative. On paper it may not seem like a good idea to have little calm pauses, but in practice it works provided the pauses have a purpose and do not just halt the narrative for the sake of giving people a break. Raiders would be greatly diminshed without its musical accompaniment. This is arguably John Williams’ finest popcorn cinema score, surpassing even his signature work, Star Wars. “The Raiders March” probably has more hooks per square centimetre than any other creation in his oeuvre, from the crowning flourish of sixths, to the flurry of seventh chords or the rousing move up one half step for the final statement of the main theme. Hearing the march slowly fade back in at the end of the credits arrangement is like seeing an old friend approach from the distance. Williams’ adroit employment of the theme’s many bits of musical grammar throughout all four films is a joy to behold. His Lost Ark theme also ranks among the composer’s most memorable creations, particularly in its arresting and compelling use when the Lost Ark is finally opened. The snapping, slashing percussion used as the scene turns nasty further demonstrates Williams’s uncanny ability to hit upon exactly the right music device and tone to enhance the onscreen action. Raiders feels a bit like a well-loved adventure comic book, and all its visuals contribute to that feeling and that style. The attention to detail is evident in the various sets and locations alone. For instance, great pains were taken to remove all the TV aerials from the rooftops in the small Tunisian town that doubles for Cairo – because nothing destroys the effect of late 1930s Cairo like several hundred TV antennae sticking out over the houses in a wide shot. This being a time before computer technology was advanced enough to do complicated digital removals, it meant manually taking down all of them before shooting began. Talk about hard work! ILM cut its teeth on the visual effects of Star Wars and sharpened its claws on movies like Raiders of the Lost Ark, and even from just watching the latter, it’s easy to why ILM is at the forefront of movie visual effects work now. The effects highlight of Raiders is definitely the climactic sequence of the opening of the Ark of the Covenant: spirits fly out and float around before turning demonic, lightning shoots out of the Ark and zaps the Nazis to death, a stream of fire follows the lightning, and Belloq and Toht die in a rather spectacular manner. For the demise of the two main villains, models of their heads were made and then subsequently blown up and melted, filmed at below normal speeds and then sped up for the final composite. Even by today’s standards, the result of those two effects in particular are quite admirable. You can hardly tell where the set ends and the painting begins. Harrison Ford’s immense charisma and comic timing are an essential element of the movie’s appeal. His delivery of the line “Snakes… why’d it have to be snakes?” has the immaculate phrasing of a great comic. Just try to imagine Magnum P.I. star Tom Selleck in the role of Indy, as was once intended. Would Raiders still have been a rollicking good time at the movies? Probably. Would the character of Indiana Jones have become the cinema icon we know today? Unlikely. Much like James Bond is the quintessential Englishman, Indy is the ultimate distillation of the American character – resourceful, inventive, self-reliant, two-fisted, not to mention slightly xenophoic, destructive, crass and greedy. Raiders may have been filmed in Great Britain, but thanks to its resolutely Yankee star and creative team, the movie is as thoroughly American as any action film you’ll find. Who needs swords when you have a gun? Rarely mentioned is the film’s high level of violence… this film is bonecrushing in a way that no James Bond film ever was (at least until the recent reboot). Indy’s callous execution of the Arab swordsman is one of the film’s most famous scenes (as is well known, it was improvised by Ford, who was sick with dysentery at the time and little inclined to perform an elaborate fight sequence that didn’t seem strictly necessary), but it always seemed slightly crass and insensitive to me. John Williams’s score is complicit here, trotting out some light-hearted tones to accent the “joke.” A similar sequence of questionable taste occurs in The Last Crusade, wherein Indy fires a shot from a Luger that passes through and kills an entire series of German soldiers (once again accompanied by “amusing” pizzicato strings to emphasize the supposed humor of the moment). The spectacular effects at the film’s finish, particularly Ronald Lacey’s melting face, are gorier than anything you will find in Psycho, Texas Chain Saw Massacre and Halloween combined. This slight hint of mean-spiritedness foreshadows the later, tougher films in Spielberg’s career (War of the Worlds, Munich). For all its press about a light-hearted tone, Raiders is just as dark as its oft-maligned but arguably superior sequel, Temple of Doom. Why is Raiders still great? The script is lean, muscular and witty… great dialogue, great characters. You could take any number of scenes (Indy and Marion’s first meeting, Belloq’s chat with Indy in the Cairo bar), plop them into an acting class, and do a scene study. How many action movies can claim that? The movie also caught George Lucas, Steven Spielberg, Harrison Ford and John Williams at the peak of their creative powers. Despite its pulp sources, the movie manages to incorporate a myriad of memorable and original touches – the ending “light show” and gore effects (both of which hold up very well by today’s standards), the fun “twist” at the finish, the coat hanger gag, the crazy stunts, the spunky heroine, et cetera. Spielberg and Lucas may have been inspired by Bond, but their movie outstrips its spiritual inspiration in almost every way. Basically, it’s like a snazzy exciting remix of a classic song… all the beats are familiar, but it’s been re-orchestrated in a way that gives it a lot of snap and freshness, even in 2011.